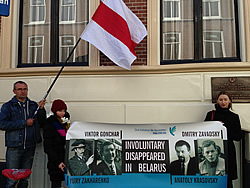 On Monday June 16 traditional action of solidarity with the family members of the involuntary disappeared Belarusians and with all the victims of the totalitarian regime of Lukashenko is set to take place in The Hague, Netherlands. The event is scheduled from 15:00 till 16:00 local time in front of the Belarusian Embassy. The address of the embassy is Anna Paulownastraat 34. The event is initiated by We Remember, is sanctioned with the local authorities and is open for public participation.